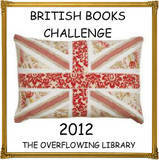 I am delighted that I am hosting the 2012 British Books Challenge at The Overflowing Library taking over from the wonderful Becky at The Bookette who has decided not to carry on hosting the challenge in 2012. To sign up for the Challenge go to yesterday's post to fill in the form. Yes. If you would like to donate prizes to the monthly prize packs that would be fantastic. Please contact me to discuss.